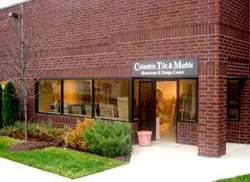 Our Elkridge Maryland showroom is convenient to the Baltimore Washington metro area. If you have any questions please call, email us at columbiatile@yahoo.com or fill in the short information request form below and click the Send button. From Howard County / Columbia MD (5 minutes): Rt 100 East to Exit 6B Rt 1 North At the second light make a left on Troy Hill Drive Once on Troy Hill Drive make your first left, then first right into our parking lot. We are located right behind Harley Davidson.